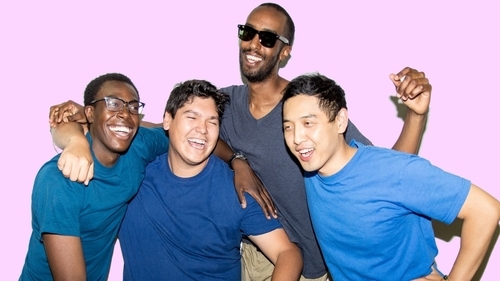 A 6IX NNNNNN Revue, playing at the Helen Gardiner Phelan Playhouse as part of the 2018 Toronto Fringe Festival, is TallBoyz II Men’s latest sketch show, and while it carries a lot of potential, it consistently falls short of its ambitious and eponymous aim. The sketches themselves are fine, if relegated to the bro-comedy wheelhouse of jokes about sitcoms and 80’s movie gags. The TallBoyz bring a ton of energy to the space, and commit to whatever the sketch needs, from sloppy makeout sessions to violent shootouts. Guled Abdi is a particular standout for committing to his characters even in the background of sketches, and dealing with his castmates’ constant ribbing – including a Captain Phillips reference that nearly took down the entire house. The biggest issue is the pacing of the show. A lot of sketches overstay their welcome, or just don’t seem to develop or progress much beyond the initial idea. At seventy-five minutes, it’s on the longer end for a Fringe show, and that time doesn’t always feel like it’s used wisely. A lengthy opening sketch feels like an overwritten prologue preventing the actual show from kicking off. The end of the show features the troupe working in audience suggestions into a final performance, which totally fell apart in my showing. The show wrapped with a reasonably satisfying payoff to the troupe’s obsession with The Seat Next to the King, but it was followed by a nonsensical rap about nautical murder, totally deflating the fulfillment of that ending. Even on top of that, the performance suffered from audio playback issues, and more than one garbled line brought down the momentum of a scene. While there is definitely space for improv and sketch to intermingle, some parts of the show would benefit from more polish. As much as I enjoyed A 6IX NNNNNN Revue when it was going well, its persistent issues kept it from really excelling. Whether they achieve their coveted rating, only time will tell. Content Warnings: Mature language; Sexual content; Strobe lights; Gunshots.